Terpenes and terpenoids are a heterogeneous class of compounds used in the perfume and aroma industry. 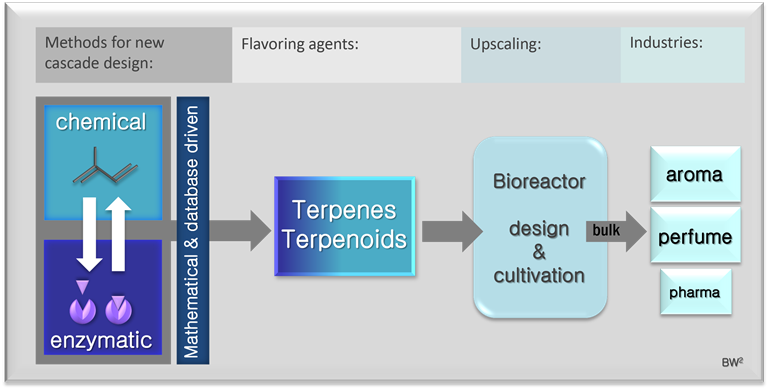 This research line focusses on cascade reactions for the conversion of terpenes to produce active compounds and to build structurally and stereochemically complex natural terpenoid products. This concept, the economic and ecological synthesis of industrially important flavoring agents and/or ingredients such as menthol or polyprenylated polycyclic acylphloroglucinol (PPAP), will be applied. Menthol is an important ingredient in essential oils, which is produced in large amounts by plants. Despite the numerous efforts to produce menthol from readily available raw materials, only a few chemical processes are known for the preparation. The class of natural PPAPs is characterized by an unusual broad spectrum of bioactivities. In the natural biosynthesis, the formation of regioisomeric PPAP mixtures with significantly different biological activities often occurs. The generation of pure regioisomeric PPAPs is of great importance for medical applications and the pharmaceutical industry. Both afore mentioned problems for menthol and PPAPs, could be solved by the combination of enzyme and metal catalysis in cascade reactions. The design and implementation of cascade reactions is a challenging facet of chemistry, yet one that can impart striking novelty, elegance and efficiency to synthetic strategies. The design of cascades to provide specific targeted molecules of considerable structural and stereochemical complexity poses a significant intellectual challenge and can be one of the most impressive activities in product biosynthesis. Our work is based on the use of biosynthetic considerations in combination with database-driven methods to guide synthetic strategies and bioreactor cultivation techniques.